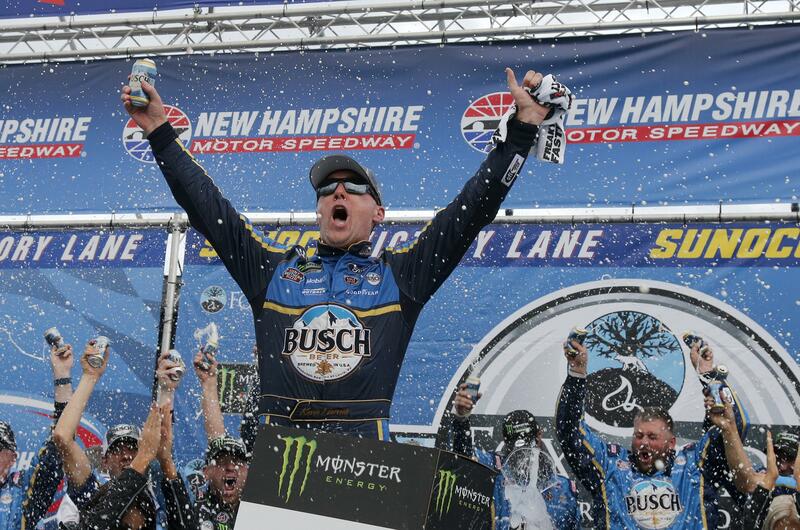 Sun., July 22, 2018, 9:50 p.m.
Kevin Harvick used a bump-and-run on Kyle Busch with seven laps left to win a thrilling battle of two of NASCAR’s dominant drivers Sunday at New Hampshire Motor Speedway in Loudon. He did what he had to do again in the No. 4 Ford to celebrate for Stewart-Haas Racing. Lewis Hamilton regained the championship lead in unexpected and dramatic fashion, winning the German Grand Prix in Hockenheim after Sebastian Vettel crashed while leading near the end. Heavy rain played havoc late in the race as Vettel misjudged a basic entry into a turn and slid over the gravel into the barriers with 15 laps to go. The four-time Formula One champion started from pole position and seemed in control. He was livid with himself, kicking the gravel in frustration as he stepped out of his car. John Force raced to his first victory of the season and record-extending 149th career Funny Car win at the Dodge Mile-High NHRA Nationals in Morrison, Colorado. Greg Anderson topped the Pro Stock field for his first win of the year and 91st overall, and Hector Arana Jr. won in Pro Stock Motorcycle. Published: July 22, 2018, 9:50 p.m.